The Latin American collection at the University of Miami Libraries contains materials that support doctoral-level research in all disciplines in Latin American Studies. The collection covers the English, French, and Spanish-speaking Caribbean as well as Mexico, Central American and South America. Our Iberian collection emphasizes topics in the Humanities and Social Sciences, especially those related to Spain and its relations with Latin America and the Caribbean. The core strength of our circulating and archival collections is material in all formats on Cuba. The Cuban Heritage Collection (CHC) is an unique source of primary and secondary materials for Cuban and Cuban-American studies, housing materials dating from colonial times to the present. These materials document Cuba's history and culture as well as the experience of Cuban diasporas and, especially, Cuban-Americans. 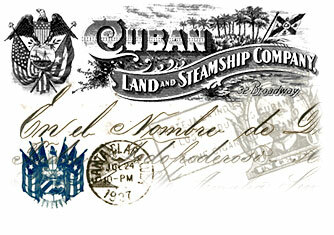 The holdings of the CHC include a collection of approximately 50,000 volumes of rare and contemporary books; periodical publications from Cuba; Cuban exile periodicals or 'periodiquitos' published around the world; manuscript collections of personal and corporate papers; and collections of photographs, posters, maps, and postcards and more. Items from selected collections have been digitized, forming the CHC Digital Collections. Online access to the finding aids for these and other manuscript collections are available. The Caribbean content in the Special Collections department is remarkable for its breadth and depth. The holdings include all but three of the dozens of books published in or about Jamaica between its conquest by the English in the 1650s and the end of plantation slavery in the British Empire in 1834. Accounts in various languages describe the slave rebellion as well as the revolution itself and its aftermath. Travel narratives and other first-hand accounts describe the societies and histories of the major West Indies islands, as well as the smaller countries like Barbados, Antigua, Trinidad, and St. Lucia. The Division also contains a number of remarkable rare titles on Guyana and Suriname, countries on the South American mainland which are historically, culturally, and economically tied of the West Indies. The Caribbean Collection stands as an important companion to the Florida Collection, and together they provide a vital link to the history of the entire region. Is a biannual, peer-reviewed journal that publishes original works by Caribbean writers and scholars worldwide. Anthurium is a project of the Caribbean Literary Studies in the Department of English at the University of Miami. The archives contain several hundred hours of material including lectures, readings, and interviews. The center examines the relationship of the United States within the hemisphere in areas such as economic development and trade, healthcare and medical research, environmental programs, education, infrastructure, and politics. CLAS is an interdisciplinary organization through which faculty and students from UM meet and discuss issues relevant to Latin America and the Caribbean. CLAS fosters research collaboration across diverse departments. The program offers an undergraduate major and minor as well as a dual BA/MA program and a Master's in Latin American Studies. The UM School of Communications' program, conducted in Spanish, provides recent graduates of communication and related disciplines and mid-career professionals with an opportunity to expand their skills and knowledge. This is a short list of organizations that may be of interest to Latin American and Caribbean Studies students. Stephen Fowlkes, Cuban and Caribbean Studies Institute, Tulane University, 2005. Compiled to serve as a beginning point for researchers working in the area of Cuban Studies and referencing sources available in various libraries at Tulane University. Encyclopedias should be used to get more information about a topic. If you are assigned a paper on Peruvian politics, you may want to consult one of the encyclopedias below to get some background information. In encyclopedias you'll usually get a general idea, and that's why they are only a starting point, so that you can get a sense of the big picture and can focus on getting detailed information from a book or an article. This vast three-volume Encyclopedia offers more than 4000 entries on all aspects of the dynamic and exciting contemporary cultures of Latin America and the Caribbean. Its coverage is from the time-span of 1920 to the present day. "Culture" is broadly defined to include food, sport, religion, television, transport, alongside architecture, dance, film, literature, music and sculpture. This new edition adds nearly 600 entirely new topics and also provides substantial revisions to hundreds more. National statistics have been conveniently tabulated for every one of Latin America's 37 countries. Dictionaries are different from encyclopedias in that they'll rarely provide context for their entry. You can use a dictionary for basic facts and definitions, but it shouldn't be your only resource. Use a dictionary instead to obtain facts, dates, etc. about a particular event or figure that you can use to build your argument. Online dictionary from the Universidad de Granada, some translations come with a sentece to view the word in context. This digital archive brings to life hundreds of documents from Haiti's colonial past. Access to many documents is still limited, as the archive is a work in progress, but do check it out. The Digital Libraries in this section include primary sources such as newspapers, or the complete writings of a historical figure, or photographs. These are all great for using in your research. Researchers interested in the study and dissemination of the history of Central America contribute original research to the AFEHC. In the website you can find full-text articles, as well as a chronology, some primary sources, and useful links. The Oxford Latin American Economic History Database contains statistical series for a wide range of economic and social indicators covering over 20 countries in the region for the period 1900-2000. The Center focuses on Latin American and Latino research on immigration and development. The website provides free access to a data archive of unique studies on the LAS migration field and to the Working Paper Series in the area. The poll, the product of a collaboration between the Institute for Public Opinion Research and the Cuban Research Institute at FIU, is updated every few years. The link will take you to the current poll. La Base de Datos REDIAL-TESIS recoge las referencias bibliogrÃ¡ficas de mÃ¡s de 8.000 tesis doctorales de temÃ¡tica latinoamericana, leÃ­das en Universidades europeas desde 1980. Enlace a las tesis doctorales de universidades venezolanas. 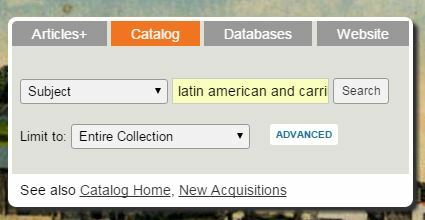 Change from Title to Subject in the drop-down menu and type in "Latin American and Caribbean Studies -- Theses"
Your search results should display on the screen. Here you can also find doctoral theses from Spain on various topics, not necessarily only about Latin America. Digital Initiatives features a growing collection of digital objects, projects, and publications developed to preserve and support digital scholarship and the research, teaching, and learning mission of the University. These initiatives feature materials from the collections at University of Miami Libraries, and from collaborative projects and publications developed with faculty and Students. - This is an image from the Cuban Historical and Literary Manuscript Collection of the Cuban Heritage Collection. Photographs taken in Cuba by Deena Stryker in 1963 and 1964, including many of the most important figures of the Cuban Revolution, including Fidel and Raul Castro, Ernesto Che Guevara, and Celia Sanchez. From the Duke University Libraries Digital Collection.